Twitter Dashboard app released for iOS and Desktop. Twitter today released Dashboard, a brand new app to help the busy people behind the businesses. With an iOS app and desktop web experience, Dashboard offers a single destination to get things done. It gives business owners a clear picture of what's being said about their businesses, lets them schedule Tweets, and offers insights about their Tweet performance. 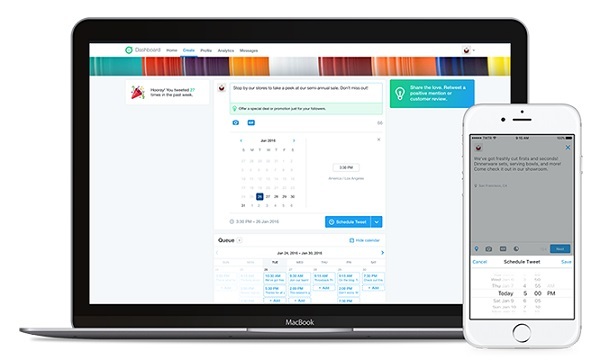 The Twitter Dashboard beta is available to all US-based businesses today. Create a custom feed to find out what's being said about your business. Use your custom feed to get right to the Tweets you want to see first and better engage with your community. For example, if you work at a cafe, you may see a Tweet from a customer who has a question about your hours. Or, if you're a boutique owner, you might see a Tweet from a potential customer talking about one of your products. The ability to see these Tweets at a glance offers endless opportunities for you to connect with customers and potential customers with responses that add value.